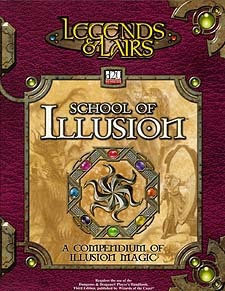 Kicking off a new series of books from Fantasy Flight Games, School of Ilusion contains everything you need to make illusion magic a key component of your game. Featuring more than 60 new spells including the mind-twisting might of apocalypse, School of Illusion brings the concept of divine domains to arcane spellcasters in the form of "disciplines." Illusionists can now master invisibility, terror, true illusion, and six other disciplines on their path to ultimate power. Best of all, the visual guide to illusions shows at a glance which senses a spell affects. This book also contians 9 new prestige classes and a new core class - the devoted illusionist. In addition, it contains dozens of new items - both magical and mundane - to delight players. Whether you're customizing your very own illusionist's robe or wielding the awesome might of the staff of the illusionist, you'll never look at illusion magic the same way again.